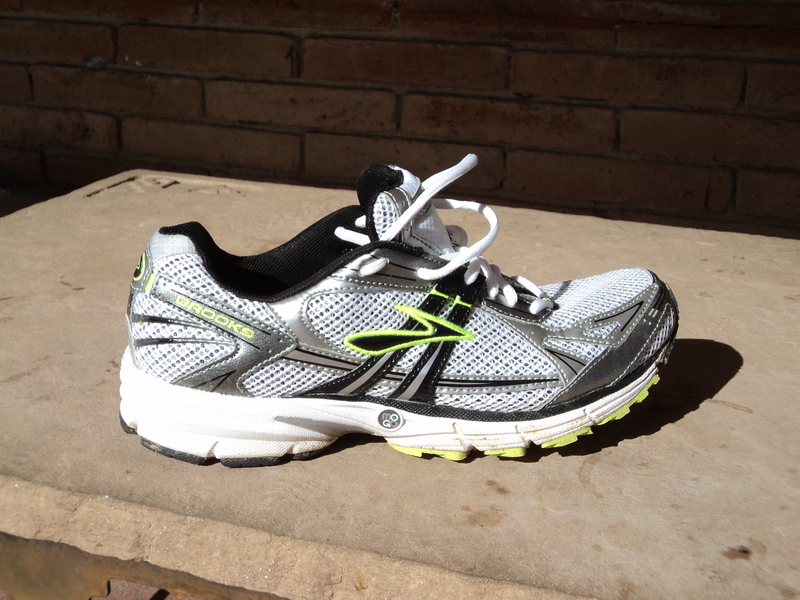 This is my third pair of Brooks Ravenna running shoes. These are the shoes that a person named Chrissie Wellington wore on her feet winning her first IM Hawaii title, Challenge Roth and a few other Ironman races. My interest was piqued in these shoes after talking with the marketing director at Trisports after the Brooks rep had talked to them during product training. I was searching for another shoe and the marketing director suggested I try these. A suggestion I’m glad I took. Brooks calls the Ravenna 2 a Guidance shoe. I’d label it a lightweight neutral trainer. 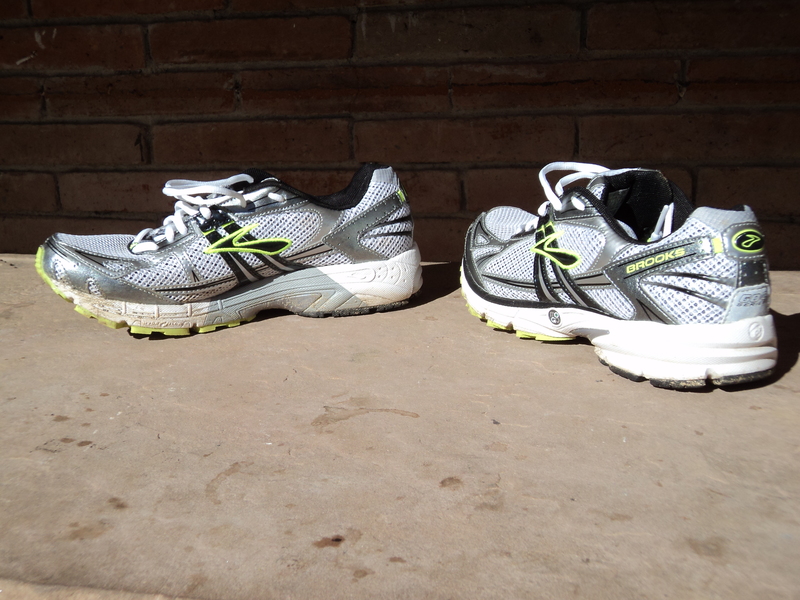 Brooks claims 10.8 ounces, but it runs lighter and feels lighter when you handle it. The Ravenna 2 has a DRB – Diagonal Roll Bar and a DRB Accel, which is it’s medial posting and thermoplastic shank for it’s medial posting. Mild over pronantors which I happen to be on the right, will like that it works with out being intrusive. Neutral runners, which my left foot is, will not be hampered by it. The heel sits around 26mm off the ground, the ball of your foot about 13mm. One of the unique features of the Ravenna 2 is the biodegradable mid-sole called the BioMoGo. This shoe fits well. Snug in the heel, enough room for high volume feet in the forefoot without pinching or numbness. The lacing system works well and Brooks includes enough shoe lace to tie a double knot with ease. Enough of the technical stuff. How does the Brooks Ravenna 2 run? The answer is – Awesome! This is a shoe you can run every day pace in, run fast in, run long in or run fast and long in right from the box. My first run right out of the box was just over 13.5 miles on trails through a forest. The Ravenna 2 handled the off camber, the wet leaves, rocks, roots and mud with no complaints. It handled the tempo portion of the run through wet grass with no slipping during toe off. My second run was 10 miles over dirt roads and a little pavement. Again there were no complaints from the shoe or my feet even on the steep paved up and down hills. 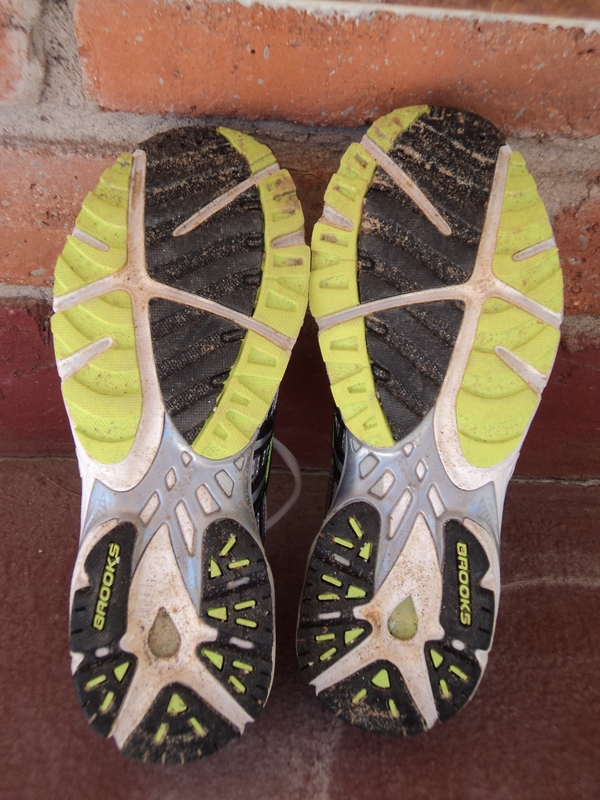 The bottom is aggressive enough with out being a mud collector nor does it take away from the feel of running. I had just over 3 hours on this shoe in the first two runs. No blisters, no black toes, and once I set the laces to my liking I never thought about these shoes again while running over any type of terrain. The Ravenna 2 would make a great long course triathlon or marathon racing shoe, as Chrissie has proven multiple times. In fact I’m torn between the Ravenna 2 and the Asics Gel DS 16 which I reviewed here for my long course racing shoe. The Ravenna 2 would also make a great shoe for track or faster running days while being durable enough for an everyday trainer. Unfortunately Brooks has not capitalized on Chrissie’s wins, nor have they told the masses how good the Ravenna 2 really is. A little publicity could take this shoe a long way. There are many lessor shoes being worn at races in greater numbers. The Brooks Ravenna 2 is a front pack running shoe worthy of the podium but unfortunately Brooks has yet to make a name for the Ravenna 2.
how is the fit of the ravenna 2 compared to the ravenna? do they run small, large, or consistent? What was the name again? I think you only mentioned it six times in that last paragraph 😉 I’ve been wearing these for the last few months and agree with your overall assessment – just enough support but not too much to benefit one foot at the expense of the other and a good, consistent ride across a range of surfaces. Really helping me to get out there and run confidently.